It is our mission to be the premier aviation services provider in the upper midwest by being perceived as a valued problem solver within our industry. 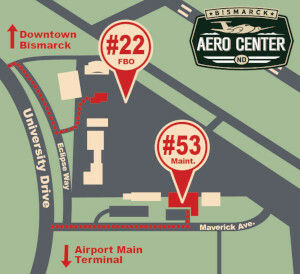 Bismarck Aero Center was first founded in 1990 as Aircraft Management Services (AMS) by Bob Simmers and specialized in aviation consulting, specialized flight training, aircraft storage and pilot services. In 2002, Bob partnered up with long time Director of Maintenance, Mike Aarestad, and expanded operations to include aircraft maintenance and repair. The partnership was a defining moment in our company history and has allowed us to build strong relationships within the aviation community. Then in 2006, we continued to diversify our services by forming the subsidiary, Dakota Avionics. With our Limited Repair Station Certification from the FAA, we offer avionics sales and repair. Our facility is equipped to handle all aircraft maintenance and avionics needs from stick and fabric to turbine powered aircraft. Our biggest change came in 2008, when we became Bismarck's newest full-service FBO and changed our name to Bismarck Aero Center. We offer Jet-A and 100LL fuel, pilots' lounge, courtesy cars, concierge services, 20-minute quick turns and other great amenities. We still take pride in providing #1 customer service, adding 24/7 certified NATA staff and red carpet service for all who visit us! Check out the services tab to see how we can help you and make sure to contact us with any questions you have. We will always be happy to assist you!